I have a challenge, nay, a dare for you, faithful readers. If I was completely nuts like my wife, family, and friends think, then of course, I would challenge everybody to go vegan or as close as I am getting in my journey toward health. But to prove that I am not totally crazy, my challenge is for people to cut down on their meat and dairy intake for a month. If I was a kid again back on the playground, I would be calling people out and daring them. I would be double dog daring a few of my friends like Mike, a friend and faithful reader who loves to give me grief about everything. He does so on my Facebook fan page as well as in person and we have a great time. But I wonder how he will respond to my double dog dare. The challenge or dare is for people to eat only 10% of their total caloric intake as animal-based food for one month. Looking at the number does not really mean much to people so I will give you a picture. Actually, the accompanying picture is a pretty accurate description. Three ounces of meat is about the size of a deck of playing cards. 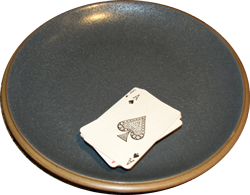 (Thus the picture of the playing cards on the plate.) That three ounces of meat represents about twenty grams of protein, which is just over a third of the recommended protein intake for adult males (56g/day). The real challenge for most people is that the deck of playing cards represents all the calories in a day from any animal source. That includes milk, cheese, yogurt, other dairy, and eggs. I know it sounds crazy and that deck of playing cards sized piece of animal product does not seem like a lot in our society of burgers, fries, and shakes for every meal. But it is plenty. The trick is to get lots of fruits, vegetables, and whole grains in our diets instead. After all, the premise of a whole foods, plant-based diet is not to just get rid of animal products, but to keep processed foods to a minimum as well. This brings me back to the first question people ask vegans. “How do you get enough protein?” I did not know how to answer this at first, but now I know that there is protein in pretty much everything we eat. Plant and animal foodstuffs all have protein. As long as all the nutrients have not been sucked out of them through processing. That is why eating almost vegan necessitates eating as much whole food as possible. So why would anybody take this challenge in the first place. If anybody is on a diet, there is a huge benefit to eating mostly plants. You never need to count calories and you can eat as much as you want. When I think back to all the different types of eating systems I have tried so far, I must say that not feeling hungry is the best way to lose weight and get healthy. And eating vegan (or close) is the way to do that. People might think that I am fanatical, and maybe I am. But I am not trying to sell a product or do anything besides tell a story. Hopefully, that story will include some of my readers who have enough (or maybe too much) guts to take this challenge. If so, I hope that they consult with a physician (a healthy vegan doctor is probably too much to ask) and read credible sources about nutrition (find out about vitamin B12) as they go through this journey with me. I know I am probably crazy, but others ought to at least try this one part of my craziness. Even if it only for a month. So I hope you take the challenge to eat 10% (or less) of your calories from meat and dairy. Actually, I more than hope you do. I dare you.